We improved the clarifying text for the Group Inbox email privacy setting and added an example of how an email is visible for colleagues in the activity stream. 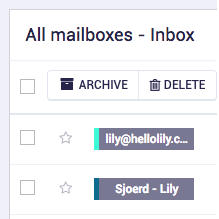 When the ‘All mailboxes’ mailbox is selected and active, the text is now also colored ameland blue just like the other mailboxes. Admins are now able to edit the internal numbers of everyone in the Users list. We’ve added labels of all your mailboxes to the ‘All mailboxes’ box. Use these to easily see in which mailbox you received the email. Besides the label’s name, a colored line on the left helps to quickly see where an email came from. You can change the color of it by editing your email account and selecting a different label color.